Whether you’re stopping by our main location or any of our outlet locations, there is so much to see, do, and taste in the upcoming seasons. October is Wine month in Pennsylvania — which means wineries and wine lovers everywhere are relishing in this wonderful season. It’s always fun this time of year to take a drive up to Lake Erie, and see the fall foliage as well as many vineyards harvesting their grapes. We’ve got a lot of plans for those grapes — about 35,000 gallons will be coming through our wine making warehouse in the next 12 months, ending up in about 175,000 bottles for you to enjoy. In addition to our wine, we’ve compiled some other ways to celebrate fall and the upcoming holiday seasons with us! Our guide to making the most out of the fall season in Shippenville. Our Farm to Table Dinner starts it all off on Thursday, October 18th! Local farmers will be here to talk about their offerings while a 5 course meal is served along with wine pairings. Finish the night dancing under the stars to Bryan Phillips’ smooth voice and guitar. The Harvest Celebration Weekend continues with Robyn Young on Friday from 6:30-9:30 PM singing country hits. Saturday, 1:30-4:30pm: Self Preservation, They are an acoustic duo that plays a little of everything, they have a variety of covers they can play. Whether it is todays hits or some good ol’ classics. Come out and enjoy the afternoon while listening to this fantastic duo! Saturday, 6:30-9:30pm: 732 Electric Duo bring hits from the past 5 decades to our stage! Sunday 1:30-4:30pm: Junction PA from Grove City. This is a Big Hit band that opened for Little River Band just a couple months ago. They love to rock the house! Raffle winners drawn Sunday at 4:30 PM. Let us help you take the perfect gift to your Thanksgiving Dinner host, or help you serve our delicious mulled wine kits. Various flavors of our wines like our Cranberry Mist, Angry Antler, Autumn Breeze, or Rustic Red mixed with a few ingredients plus our organic Mulling Spices make the best warm wine drink around! Not to mention, the house will smell so delicious if it’s being warmed on the stove. For dessert, be sure to pick up some of our Delectable Wine Sorbets. They’re delicious on their own, or when served with fresh, warm baked goods. 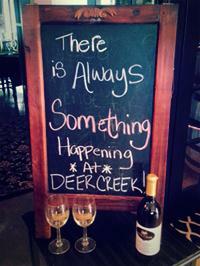 Deer Creek Red: A blend of Fredonia and Niagara grape wines, that is sure to be sweet and delicious. First Holiday Edition Cherry Merlot: This wine is a Black Friday – Cyber Monday special. You can only get it that weekend! Winter Chill: Vino’s Limited edition 100% Pomegranate wine! This year we are donating $1 of every purchased bottle to our local Animal Friends organization that helps animals. Red Reserve: This wine is the only port in the Deer Creek family, and it is the only wine that comes in a growler. Giving the gift of wine for Christmas is always a good idea! Come to any of our stores and we will help you find the right wine and accessory for everyone on your list. Plus, get Secret Santa Savings cards with your qualified purchase in December! Ask for details at your purchasing location. Winter is a time to enjoy friends and family in December and then settle in for some extra snuggles and relaxation during the colder months of the year. Our winery offers the same weekend FREE live music concerts starting Thursday evenings and other events in our spacious Gathering Place during this season. Our venue spaces are perfect to rent for any holiday party! Who needs a holiday to just get away, relax, rejuvenate, and reconnect! You can’t go wrong by surprising your partner with a few days away at The Inn at Deer Creek Winery! Make it a weekday getaway and save — rates are $50 less per night during the week January — March, 2018! Call and talk to Ashley for all the specials!